RapReviews.com Feature for March 19, 2013 - Swollen Members' "Beautiful Death Machine"
After a three decade span from the late 1990's through the early 2010's, Swollen Members have shown an enviable amount of longevity in the music industry. Many groups flame out long before that due to substance abuse, record label politics or the old standard "irreconcilable differences" due to big egos within the crew. Well the Members of this crew may be Swollen, but they haven't let their big heads get in the way of becoming hip-hop legends. Not only are they arguably the most famous rap act to ever come out of British Columbia, they maintain a devoted following South of the Canadian border despite the fact Mad Child has actually been banned from legally entering the United States (it's a long story). I'm mental - nothing that I do is accidental"
C-Lance picks up wherever Rob leaves off, providing equally brutal beauty on songs like "Colossal Beasts" featuring the Demigodz (namely Apathy, Celph Titled and Esoteric) - a super-collaboration of "East coast meets West coast" nobody who ever used that phrase imagined before now. The thing that remains intriguing about the Members is how they can flip any style and seemingly make it fit their presentation. "Juggernaut" juggles several in one song - Prevail spits over a super fast futuristic beat to open, Mad Child comes in over a dirty grimey bass to follow, and then they trade off and flip flows over each other's previous instrumental. It's like jigsaw puzzles from two different songs that still somehow fit perfectly - a truly avant garde rap song. "Punk rock 808's, brass knuckle heavyweights, hip-hop heavy bass" perhaps sums it up best. Swollen Members is so well polished as a crew that guest appearances tend to be the exception as opposed to the other. Other than "Colossal Beasts" the only songs with guests are "Death to You" featuring Ill Bill, Slaine & Vinnie Paz and "Fear" featuring Snak the Ripper. There are only twelve songs and 45 minutes total though, so that actually ends up being a third of the album. 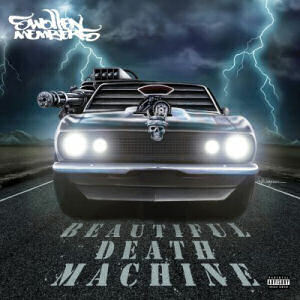 Let me step back though because that sounds like a complaint and it's not - "Beautiful Death Machine" is not too short. From the Middle Eastern influenced sounds of "River Monster" to the heavy hitting synths of "Almost Famous" the Members ring all the right bells in a pugilistic display of Canadian hip-hop. "I'm a reaper with a sickle, a twisted little sicko, I'm as vicious as pitbull" brags Mad, and you might just believe it too based on vocal tone alone. That being said it's worth noting his style is not for everybody - much like guest Vinnie Paz he's a very polarizing rapper in terms of his pitch and delivery. If Jay-Z is like a smooth mellow shot of Maker's Mark, then Mad Child is like wolfing Bacardi 151 and Swollen Members follows it with a smooth Prevail chaser. If you like the burn, this machine is beautiful.